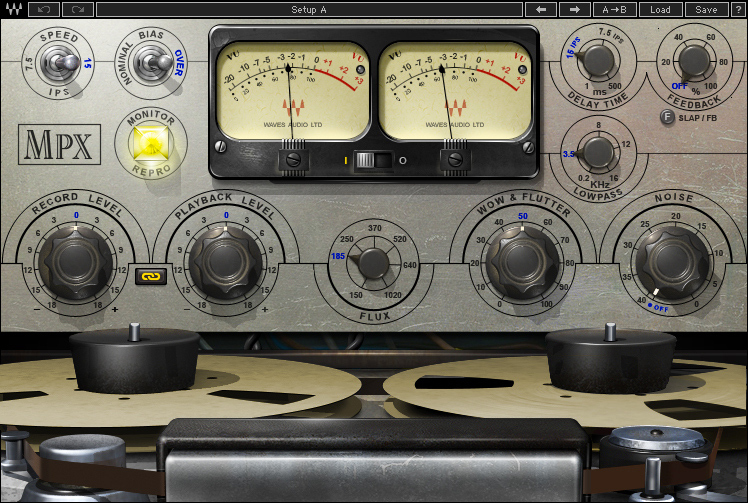 Developed in association with Eddie Kramer, the MPX Master Tape plugin is modeled on a rare reel-to-reel machine consisting of an Ampex 350 transport and 351 electronics. It has adjustable tape speed, bias, flux, wow & flutter, and noise parameters, to give you comprehensive control over the contours of your sound. It also has a flexible slap & feedback delay, ideal for rock, dance, dub, you name it. For recording, mixing, mastering, and more, bring the richness and warmth of real tape saturation to your DAW with the MPX Master Tape. Available in VST, VST3, RTAS and TDM plug-in formats. MONITOR selects the monitoring mode. VU METER displays input or output level. VU CALIBRATION controls the VU meter headroom calibration. DELAY TIME controls the time of the tape delay effect, with settings for 7.5 ips (266 milliseconds) and 15 ips (133 ms). DELAY TYPE toggles between delay modes. FEEDBACK controls the amount of the delayed output signal. LOWPASS controls the LP cutoff frequency on the delay path. LINK I/O links Record and Playback Levels controls. WOW & FLUTTER controls the speed and gain modulations and fluctuations. NOISE controls the level of added modeled noise but not noise modulations and signal additive noise.